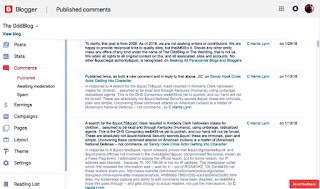 We have been receiving bizarre spam containing specific keywords meant to trigger responses through Blogger and similar platforms we use for communications. Several of these contain death threats, mostly of a veiled nature; all are threatening. 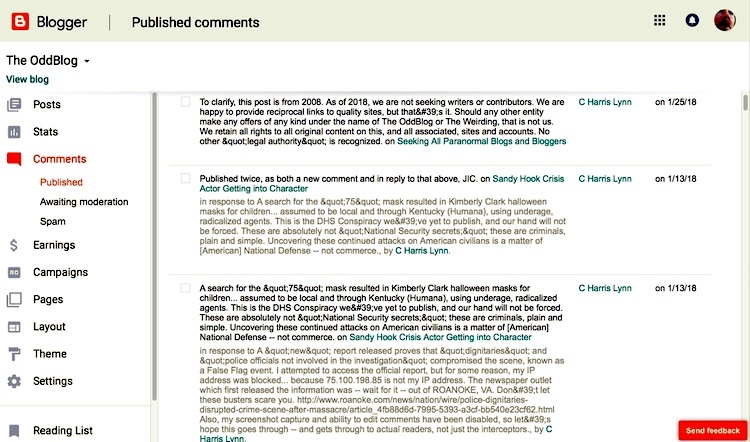 The "faded" comments may not appear to the public, though they do appear to us as administrators and when we view the blogs. We have been informed that this is a "security issue," and have traced it directly back to the DOJ, and a number of high-ranking politicians and defense contracting firms in which they are heavily vested... as well as numerous "news" and media outlets, comprising the Press Corps (also military). In fact, one of the highest-ranking DOJ members -- Rachel Brand, (I told you that was important, her being a female) -- resigned just today to take a high-ranking position at Wal-Mart (on which Hillary Clinton was once a boardmember). The gangstalking and terrorism has not ceased with her departure, so her motivation is unknown. Were one to speculate, she may have failed to coerce certain Law Enforcement members into doing her bidding; or, she may have decided to distance herself from a Treasonous agency under heavy fire for numerous Human Rights violations.